I can’t believe a month has gone by since Gracie was born! Time is flying. After Turner was born, it was truly survival mode. I was exhausted and anxious at the sound of his cry. Nothing prepares you for those first few weeks when you’re all learning on the fly and getting to know each other! This time around I have been able to enjoy newbornhood much more. I guess it’s just that life has to continue on since we already have such a routine established with Turner. Gracie just has to go with the flow! Plus I know how temporary this phase is! 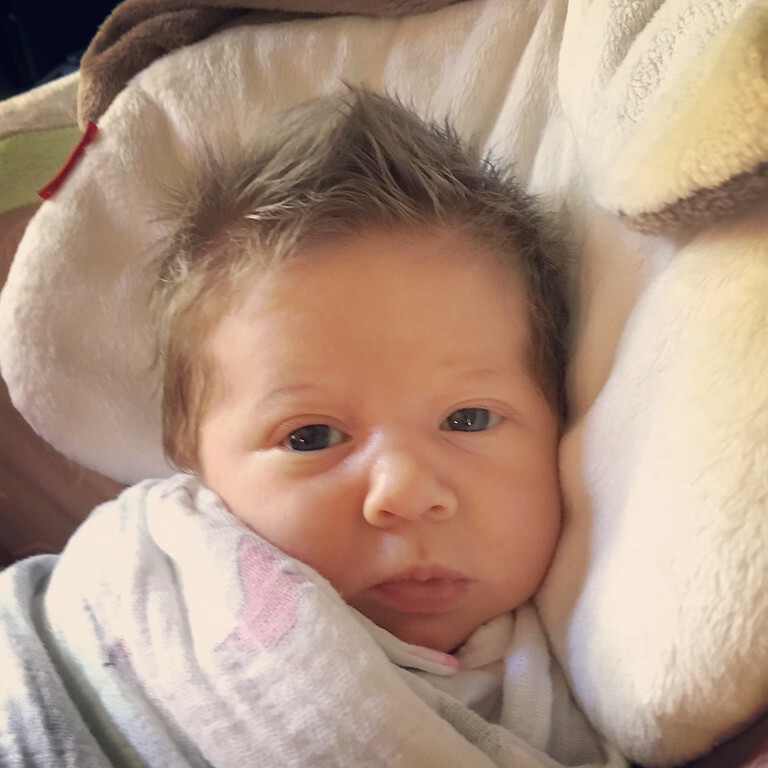 While some of my Must Haves are the same from when Turner was born (original post HERE), I have an updated list for our first month with Gracie. These things have been life savers for us this go around! I recommend every.single.one! 1. Boba Baby Wrap -This wrap is so easy to tie and holds Gracie so securely. I had the K’Tan with Turner and it never seemed to hold him tightly enough. This one is super supportive for my back AND for Gracie! 2. Aden + Anais Swaddle Blankets -We have a million of these floating around between the two of our kids (Turner still sleeps with one every night). They’re so soft and breathable. We swaddle Gracie in one for every nap and they’re absolutely amazing! 3. Stumptown Cold Brew Coffee – Because I’m a coffee addict, this is a must have for me! I drink my regular coffee hot in the morning, but I love an iced coffee in the afternoons since it’s still 75 degrees out! These are sold at Whole Foods and are delicious over a tall glass of ice with a splash of cream. YUM! 4. Bamboo Washable Nursing Pads – I didn’t even use these with Turner, probably because he ate constantly, but they are a necessity with Gracie. The disposable ones are so uncomfortable. And, let’s face it, I am over wearing bulky pads anywhere on my body! These are soft and fit perfectly in my nursing tanks. I sleep in them every night too. Then I just wash them with our regular laundry and they’re good as new! 5. Leachco Infant Lounger – We used the Rock ‘n Play Sleeper at night with Turner, which is truly wonderful. We moved him out of our room at 5 weeks which we plan to do with Gracie too. In the meantime, we’ve been a bit lazy and have her sleeping in this lounger in our bed. It is THE BEST invention ever! I can’t even express how miraculous it is. She’s on a slight incline which helps with any reflux or spitting up (which we luckily haven’t had to deal with), and it holds her in the same position all night! 6. HALO SleepSack -During the day, the swaddle blankets are great. But at night, when she sleeps for longer periods of time, this is much better because she can’t break out! That’s usually what wakes her up from a nap. So we wrap her up and velcro her in after her last feeding and it stays in place all night! Gracie at 4 weeks. I can’t even with this hair! We converted Turner over to a twin bed a few weeks ago. Big step! It was so weird not seeing him in his crib! I was a little worried, because I didn’t know what to expect. I asked my mommy friends who have older kids. They all assured me that Turner wouldn’t get out of his bed, and it would be an easy transition. It actually was a pretty easy transition. We kept every other part of his night routine the same. We let him sleep with a book and a toy of his choosing. That sort of motivated him to stay in bed. In the mornings, if he wakes up really early, he’ll get out of bed and play with his toys. If too much time goes by (like when I had bad morning sickness) he’ll start knocking on his door. We seemed to have worked out the kinks now and he loves laying in his bed until we go get him. It’s still a work in progress, but started planning it around trucks and cars, Turner’s current obsession! We got his bedding from Target and painted a magnetic road on the wall next to his bed so he could play with cars on the wall. 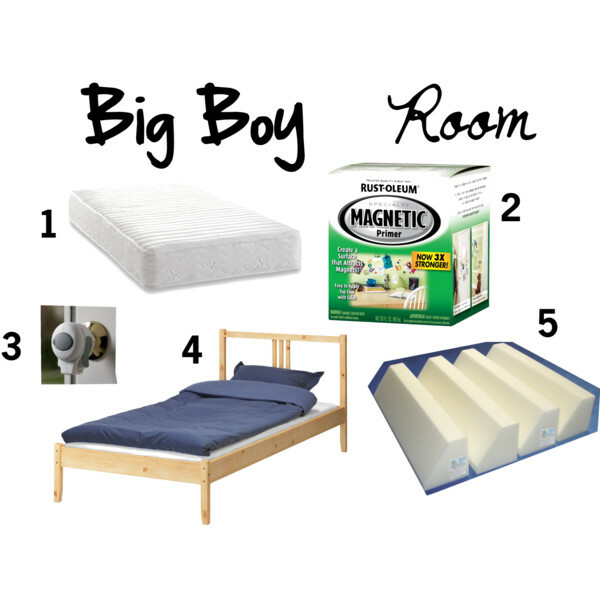 I’m excited to finalize his room and share the finished photos in the weeks to come! 1 Twin Mattress – We ordered this on Amazon. I have always loved amazon, but I loved it even more after this purchase. $150, and BOOM, this mattress showed up shrink wrapped on my porch a few days later. We opened it up and were shocked at the quality of this mattress! It was really impressive. 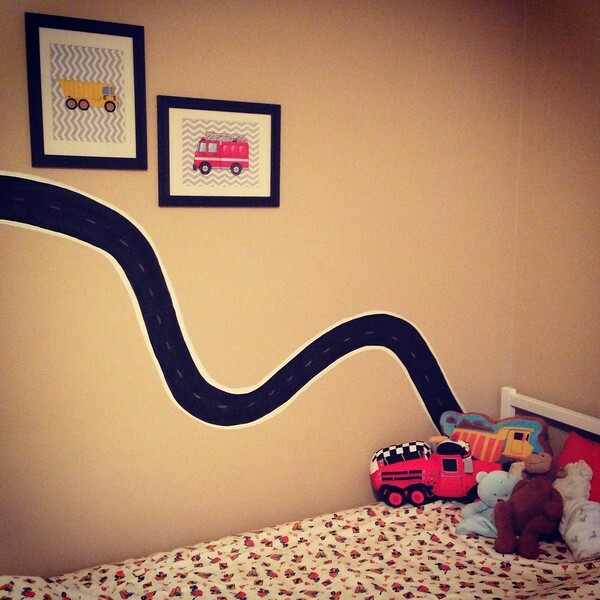 2 Magnetic Primer – We went with a cars/trucks theme for Turner’s room, because he’s obsessed. I used this magnetic paint to paint a street on the wall next to his bed. Then I bought some magnets and glued them on the backs of a few of his tiny cars. That way he has his own little racetrack next to his bed! 3 Door Knob Lock – These are a must. I was wracking my brain thinking of ways to keep Turner from getting out of his room if he woke up. We have these on a few other doors around the house. And, it hit me! We put one on the inside of his door so he can’t open the door and get out! 4 Bed Frame– I found this on Ikea for $40! Stew cut a piece of plywood to fit the base of the bed to hold Turner’s mattress up. If you don’t want to go through that, there is a slatted base piece that fits on the bottom. We slapped a coat of paint on there and it looks incredible! 5 Magic Bumpers – I was skeptical about these at first. But they really work! They stick to the mattress really well and don’t slide around. We have one side of Turner’s bed against a wall and then these bumpers surrounding the other side and bottom of his bed. Redken Diamond Oil Shampoo and Conditioner : I have noticed a big change since I switched over to Redken. My sister in law always swore by these products, but I didn’t want to spend the money. To save money, I buy the bulk size and just refill my small bottles as needed. After having Turner, my hair completely changed! It used to dry pin straight and I didn’t have to do a darn thing to it! Now, it’s wavy in some places and straight in others. I have to blow dry it with straightening serum so it looks straight! I noticed that my hair was much silkier and smoother after using Redken. I can even let it air dry and scrunch it, and I get that beachy look. 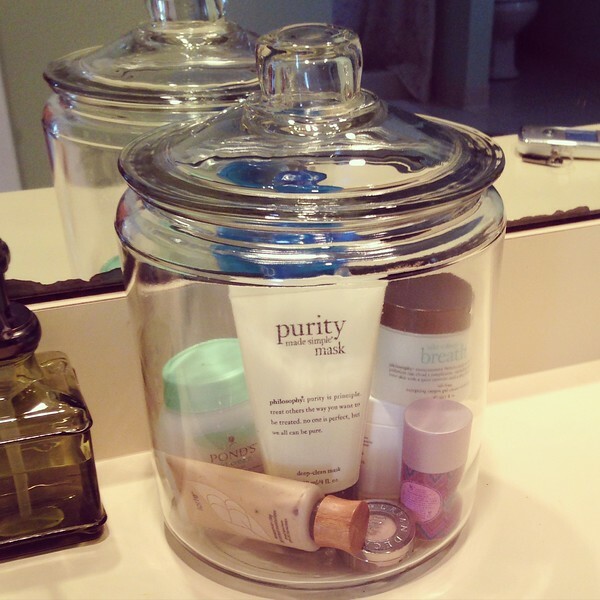 Philosophy Purity Mask: I recently updated some of my beauty products to include a few Philosophy products. Again, pricey, but they last forever! This face mask is amazing. It feels exactly like the products they use at the spa. And it has a nice soft clean scent too. It’s gentle enough to use every day. But I’ll alternate between that and my regular old neutrogena wash. Philosophy Take A Deep Breath Oil-free Moisturizer This moisturizer is light and clean feeling. I have a weird thing about stuff on my face. I feel like it’s clogging my pores. But this is so light that you don’t feel like you’re wearing anything at all! L’oreal Voluminous Mascara This is a great go-to mascara. 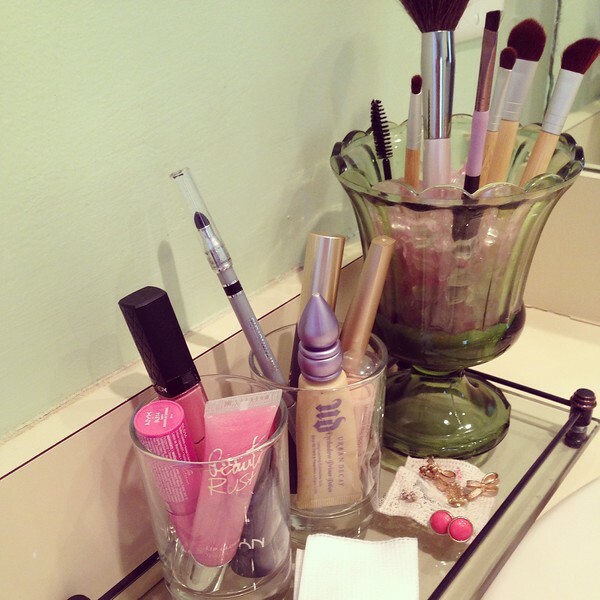 It’s inexpensive and works really well! L’oreal Lineur Intense I really like the liquid eye-liners. This one you have to shake between each use. But I like it because it’s easy to control the tip since it’s felt. Tarte Tinted Moisturizer As I mentioned before, I HATE the feeling of stuff on my face. So I don’t wear foundation. This is the perfect replacement. I wear it during the winter, but it’s especially awesome during the summer. It’s light enough that you don’t feel like you have makeup caked on or that you’ll sweat it off in about 5 minutes. It looks very natural but just evens your skin tone and gives you that natural glow. Happy Spring Cleaning! Feel free to share your tricks and tips with me! I can’t get organized enough! Here are some fun Valentine’s Day gift ideas for you, your man, and your mini! Hope you enjoy! Here are some great gift ideas for everyone you love! 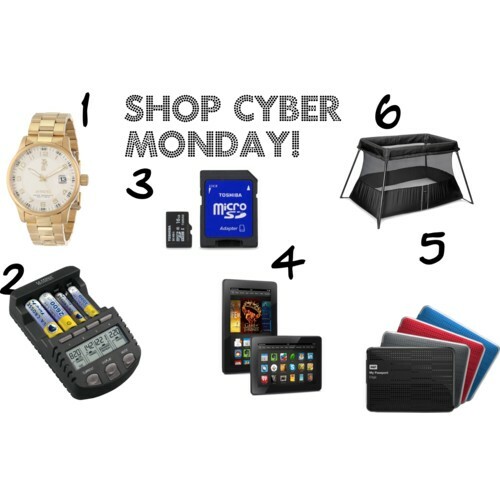 Today is a great day to get your holiday shopping done! Cross that one off the list! Act FAST! These deals are flying! Happy shopping! I can’t believe I just typed that title! Every month, when I make these boards, I’m shocked at how fast Turner is growing. I can’t believe he’s actually ONE! We have a TODDLER! This is what we’ve been into the past month. 1 Munchkin Snack Catchers This is the best invention ever! This kid loves to eat! I have to give him one piece of food at a time, or he’ll shove it all into his mouth at once! This cup slows him down. I put his Barley Puffs or Happy Puffs in there so he can only get a few out at a time. 2 Tiny Diner We picked this up a few weeks ago and fell in love! It has suction cups that stick to the table. Usually, I wipe the surface in front of him when we go out to eat. But with this, I don’t have to. It even has a pocket to catch the food that falls off the table. Genius! 3 Puffed Barley Cereal I got these as an experiment. I put a few puffs on his high-chair table while I got his oatmeal ready, and he LOVED them! What a better idea than the Happy Puffs (or whatever puffs you use). You get a whole box for the same price as a little jar of those other puffs. And it’s just one ingredient! They have puffed rice, millet, and kamut too. Such a healthy alternative. 4 Long Jane Pajamas The next few are for Momma. I fell in love with these PJs from Victorias Secret! They’re so cute and comfy. PLUS Turner and I can match when we change into our PJs. How fun! 5 Dark Chocolate Peppermint Ice Cream- OH MY GOSH. This ice cream is from Whole Foods. It’s the 365 brand, and it’s only out for a limited time! So go get it now! Unfortunately, there was no picture on their website, so I put the pumpkin up so you can see what the packaging looks like (only it’s pink). Stew and I are OBSESSED with this ice cream. We have a little bit every night. My guilty pleasure. 6. Sparkle Nail Polish Definitely not for Turner. I am addicted to my sparkly nails these days. I put it over any color, and it looks awesome. Last week was gray. The week before was dark purple. It makes any color more festive! Just in time for the holidays. This has been a crazy past two months! Turner seems to be growing before our eyes! It’s hard to believe he will be one in less than a month!! He is hilarious and really forming a personality. His favorite thing to play with is the vacuum. It might have something to do with me vacuuming everyday while I was pregnant?? When he’s grumpy, I’ll start vacuuming, and he follows me around laughing hysterically and squealing! The second I shut it off, he starts to cry… insanity, I know! He’s like a real person now! He does things to make us laugh, like stinky face (I’m sure you can imagine) and waving “hellooooo”. He’s saying Mama, Dadda, and Dede (for Dexter, a.k.a Decky our dog, who Turner is obsessed with). He’s standing up and cruising on everything (furniture, cabinets, my legs). It’s hard to believe that Turner is turning into such a big boy! He plays with big boy toys and even needed a big boy car seat! Here are some of our favorites from the past two months. 1 Silicone Muffin Cups I’ve actually had these for a while. In the past I used them to make muffins and cupcakes. But they were really hard to clean and annoying. Luckily, I saved them! They are absolutely PERFECT for freezing baby food. I use the ice cube trays too, but Turner eats a TON of food, so these make bigger portions. I just pour the baby food into the cups and put them in the freezer. Once they’re frozen, I pop them out of the cup and into a ziplock bag with a label on them. To thaw, I place a few into a tupperware and put in the fridge overnight. Or, I just heat one up in a saucepan to melt it. 2 Fisher-Price Learn Through Music TouchPad We got this from Stew’s friend. Turner LOVES it! We had the Elmo game in, but couldn’t handle him. So we put Winnie the Pooh in! MUCH BETTER. Turner just slaps it and plays the same things over and over. It’s really funny to watch. He doesn’t quite get it yet. But, I’ll tell you what, I sure know my seasons now! 3 Toy Race Car These were also a gift. They’re the bigger cars, so Turner can’t choke on them. He pushes them around the entire house and chases them! He loves them. 4 Evenflo Convertible Car Seat We actually got this when Turner was about 10 months. He was definitely outgrowing his old seat. He was about 30 inches long at the time. He cried whenever we went in the car and he was a sweaty mess when we took him out. This was our hint that he was extremely uncomfortable. So we took the plunge. It was worth it! He loves his pimped out ride! 5 Baby Trend Expedition Jogger We had a hand-me-down stroller since he was born, so we never actually had to buy a stroller. We bought this the same day we got his car seat. It is a GREAT stroller, especially for the price! It rides so smoothly, and takes bumps like a champ. It’s great for our normal walks, but it’s a beast in the park or on the beach. I LOVE it and so does Turner! a ABC Mat -I never thought I’d be that mom with brightly colored toys all over my house, and I probably won’t be. But this is just a necessity! As soon as Turner started crawling, I needed a safe place for him and his toys. So we have this out in the living room. Our rug is a bit rough on the knees, so it’s the perfect cushioned play area! Now that he’s a little older, he likes to pull the letters off and chew them. It keeps him very occupied! b Battery Operated Fan – Poor little guy is a sweaty mess! No wonder I was so hot when I was pregnant! He’s practically an oven! Whenever he rides in his car seat, we pull him out, and his backside is drenched with sweat! I got this cheap fan to help circulate the air in his seat. I have it on the mirror hanging from the headrest. It helps with the heat, and it also gives him something to stare and laugh at! c Chalkboard Basket– I have this in the living room next to the fireplace. I keep all of Turner’s toys in there. It makes for easy clean up and hides the whole bright toy thing I was talking about earlier! d OXO Sippy Cup – We’re working on having him drinking out of a sippy cup. I fill it with an ounce of water just so we don’t make a mess. So far, he has sucked on it a few times. But, for the most part, he rolls it around on his tray and throws it on the floor. I think it will take a little practice! But at least he’s getting used to having it around at meal time! e Bath Toys – As you know, he absolutely loves bath time! We picked up a sack of toys from Babies R Us for him to play with. He has a rubber ducky, football, soccer ball, and some bath books. He throws them and chews on them. It makes bath time even more exciting! f OXO Drying Rack – I picked this up from my friend’s store Eat Sleep Play. Now that Turner is eating, I needed a second drying rack! Upstairs, in the bathroom, I have my Boon Grass Drying Rack which is for his bottles at night. Downstairs I have the OXO rack which is mostly for his spoons, bowls, and a few bottles here and there. It is so useful to have a rack upstairs and downstairs! That way I always have what I need wherever I am! We knew this day would come. It was only a matter of time. Turner has gotten really good at scooting everywhere. I definitely can’t take my eyes off him for too long, or he’ll be getting into trouble. Yesterday, it became real. He’s crawling! It just HAPPENED. I had a book that he wanted, and BAM, he crawled to me! So, this weekend, it’s time to baby proof! Where to begin?! I did a walk through of the house. We don’t really have too many hard corners, so I think we’re good there (for now). So, I counted up our outlets, plugs, and general “danger zones” and made a list! Hope this is helpful for you too! check smoke detectors in every sleeping area. carbon monoxide detector on each floor. Feel free to share your baby proofing experiences too! I’d love to hear them.